So should you invest in a fixer-upper? Despite a few cons, I would say yes, you should definitely consider it because of the overwhelming pros. However, before you jump into your next project, ask yourself these five questions about the deal. 1. How bad is it? There are many levels of severity when dealing with fixer-uppers. Some properties need just a few thousand dollars worth of paint, while others need a complete overhaul. As common sense would suggest, the less work a property needs, the less risk you’ll have that something will go wrong during the rehab. At the same time, however, the less work a property needs, the more competition you’ll face. This is why I generally look for properties that appear to need a lot of work to the general public but that actually just need minor fixes. For example, homes that have a bad smell because of pets or cigarettes are a prime candidate for me, because smells are easy to rectify. An ugly exterior paint job or a bad roof are also fairly easy (if costly) to remedy, but they scare away more potential homeowners. So, before you buy a fixer-upper, I encourage you really look at the property and have an accurate estimate of what it’s going to take to fix it up. Don’t go into a fixer-upper blind. Let me ask you a question: Is it better to buy a house for $120,000 that needs $30,000 worth of repairs, or a house that is $150,000 that is 100% finished? With all other factors being equal, the finished house clearly has the advantage. However, many investors fail to comprehend this logic and instead think “fixer-upper” automatically means “great deal.” It doesn’t! Often, the cost of rehabbing a project will negate any discount you might get. On the other hand, if you could get that same property for $90,000 and put $30,000 into it to make it worth $150,000, now we’re talking! Whether you plan to do the work yourself or not, fixer-uppers take time! You have to be present at the property often to make sure the work is being finished correctly, or maybe you’ll end up having to do the work yourself. I have a friend who bought a fixer-upper triplex with plans to live in one unit and rent the other two out, but it took him three years to fix up the two other units and get them rented! While this friend may still have a great investment on his hands, he lost close to $40,000 in potential rent over those three years because he didn’t have time to handle a fixer-upper. 4. Do I have the skills? Most people who are looking to get started with fixer-upper rental properties plan to do the work themselves. I actually encourage this, as long as the work is on a small scale. Being able to do your own rehab can save you a ton of money and can help you get a good feel for how long projects take so you can better manage the hiring out of those projects in the future. However, if this is your plan, do you really have the skills to take on the project? If not, see the next question in this list. 5. Do I have the drive? Or more importantly, do you have the mental skills and motivation needed to learn how to accomplish those projects? My first home was a fixer-upper, and I had never swung a hammer in my life! However, I picked up a book on home improvement and began learning on the job. I also called in a lot of favors from other people I knew and had them teach me how to do things. By the end of the project, I could install carpet, tile a bathroom, lay laminate wood flooring, solder copper pipes, and fix a leaky roof—not because I had the skill, but because I had the desire and motivation to learn. By answering these five questions for every project you are about to take on, you can better decide whether it is the right path for you. Fixer-uppers can be a great way to supercharge your wealth creation, but they also present increased risk. Just be sure to do your due diligence on any fixer-upper you plan to buy and accurately account for the hurdles you might face. Then take action, and get a little dirty! If you’ve ever had a landlord, you probably don’t dream of being one: Fielding calls about oversize bugs and overflowing toilets doesn’t seem like the most glamorous job. But done right, real estate investment can be lucrative, if not flashy. It can help diversify your existing investment portfolio and be an additional income stream. And it doesn’t always require showing up at a tenant’s every beck and call. The trouble is that many new investors don’t know where or how to invest in real estate. So here are five options, ranging from high maintenance to low. Tiffany Alexy didn’t intend to become a real estate investor when she bought her first rental property at age 21. Then a college senior in Raleigh, North Carolina, she planned to attend grad school locally and figured buying would be better than renting. “I went on Craigslist and found a four-bedroom, four-bathroom condo that was set up student-housing style. I bought it, lived in one bedroom and rented out the other three,” Alexy says. The setup covered all of her expenses and brought in an extra $100 per month in cash — far from chump change for a grad student, and enough that Alexy caught the real estate bug. Now age 27, she has five rentals and is a broker and owner of Alexy Realty Group in Raleigh. Alexy entered the market using a strategy sometimes called house hacking, a term coined by BiggerPockets, an online resource for real estate investors. It essentially means you’re occupying your investment property, either by renting out rooms, as Alexy did, or by renting out units in a multi-unit building. David Meyer, vice president of growth and marketing at the site, says house hacking lets investors buy a property with up to four units and still qualify for a residential loan. Of course, you can also buy and rent out an entire investment property. Find one with combined expenses lower than the amount you can charge in rent. And if you don’t want to be the person who shows up with a toolbelt to fix a leak — or even the person who calls that person — you’ll also need to pay a property manager. “If you manage it yourself, you’ll learn a lot about the industry, and if you buy future properties you’ll go into it with more experience,” says Meyer. This is HGTV come to life: You purchase an underpriced home in need of a little love, renovate it as inexpensively as possible and then resell it for a profit. Called house flipping, the strategy is a wee bit harder than it looks on TV. “There is a bigger element of risk, because so much of the math behind flipping requires a very accurate estimate of how much repairs are going to cost, which is not an easy thing to do,” says Meyer. His suggestion: Find an experienced partner. “Maybe you have capital or time to contribute, but you find a contractor who is good at estimating expenses or managing the project,” he says. The other risk of flipping is that the longer you hold the property, the less money you make because you’re paying a mortgage without bringing in any income. You can lower that risk by living in the house as you fix it up. This works as long as most of the updates are cosmetic and you don’t mind a little dust. If you’re familiar with companies such as Prosper and LendingClub — which connect borrowers to investors willing to lend them money for various personal needs, such as a wedding or home renovation — you’ll understand the concept behind investing through a real estate crowdfunding site. Companies including RealtyShares and RealtyMogul connect real estate developers to investors who want to finance projects, either through debt or equity. Investors hope to receive monthly or quarterly distributions in exchange for taking on a significant amount of risk and paying a fee to the platform. Like many real estate investments, these are speculative and illiquid — you can’t easily unload them the way you can trade a stock. The rub is that you need money to make money. Real estate crowdfunding is generally open only to accredited investors, defined by the Securities and Exchange Commission as people who’ve earned income of more than $200,000 ($300,000 with a spouse) in each of the last two years or have a net worth of $1 million or more, not including a primary residence. REITs, or real estate investment trusts, allow you to invest in real estate without the physical real estate. Often compared to mutual funds, they’re companies that own commercial real estate such as office buildings, retail spaces, apartments and hotels. REITs tend to pay high dividends, which makes them a good investment in retirement. Investors who don’t need or want the regular income can automatically reinvest those dividends to grow their investment further. REITs can be varied and complex. Some trade on an exchange like a stock; others aren’t publicly traded. The type of REIT you purchase can be a big factor in the amount of risk you’re taking on, as non-traded REITs aren’t easily sold and might be hard to value. Finally, to dip the very edge of your toe in the real estate waters, you could rent part of your home via a site like Airbnb. It’s house hacking for the commitment-phobe: You don’t have to take on a long-term tenant, potential renters are at least somewhat prescreened by Airbnb, and the company’s host guarantee provides protection against damages. When we purchased this East Nashville project house earlier this spring, one of the things that first drew us to the property was this little room off the kitchen that was just BEGGING to become a built-in breakfast nook! For this post, we partnered with Walls Need Love. They have beautiful options for removable wallpaper, murals and wall decals. We chose the Ida Removable Wallpaper for our nook. I don’t normally wallpaper ceilings, but in this tight space it creates a high impact, pulled together look. I am BEYOND pleased with how this turned out. And the best part is you can install this wallpaper yourself in a weekend. The first step for this project was to build three benches, customized for the space. Collin removed the trim in the space, framed out the base of the benches and then added the seat back last. The next step was to build the table. We’re not going to full DIY instructions (although let us know if you’d like to hear them all in a separate post), but Collin built a farmhouse-style table, perfectly fitted for the benches. The table top is about two inches smaller than the floor space between the benches. If there are any vents or outlets on the wall, they should be extended to outside of the bench, not covered up. For paint, Collin used two coats of stain blocking primer and then two coats of glossy untinted acrylic paint. The next step was to install the wallpaper. Our best tip is to be patient. Collin started by installing one strip from the front of the ceiling all the way down the back of the wall, and then worked out from there. For a continuous pattern, you can’t make it match from every angle, so we prioritized the front facing angle. The sides of the wall to ceiling don’t match, but the pattern hides it very well. Last, Collin installed a fresh new light fixture. When shopping for wallpaper, always order samples. I always order way too many samples, but it’s helpful because some of the time they look different in person. Samples can also help you get an idea of scale. Wallpaper – Ida Removable Wallpaper by Walls Need Love, Light – Luna Pendant in Black by Schoolhouse Electric. I’m happy we went neutral in this space because I can style it with pillows, flowers and baskets to reflect each season. I am SO EXCITED to have guests stay in our new home and I hope they love it as much as we do! My partner in crime was in town and got to see our new property for the first time. I bribed her with some cinnamon rolls to snap a few photos … always works! I hope this post has inspired you and shown what a HUGE transformation a little wallpaper can make! It made this space so much more thoughtful looking. It would have been nice without it, but with it it’s really special! Wallpaper in 2017 is a whole new animal. It’s nothing like vintage paper that takes forever to remove (I am still somewhat traumatized from the painted-over wallpaper in our last home). These days it’s easier than ever to install AND remove. So easy that some of the time you can do it yourself (or at least remove it yourself if you don’t want to do the install). And there are countless new options that look super modern. So give wallpaper a chance. Credits//Author: Elsie Larson and Collin DuPree. Project Assistant: Collin DuPree. Photography: Amber Ulmer. 2. A fire pit doesn’t have to be wood-burning. Wood fires are glorious, and in the right conditions, a wood-burning fire pit can be the perfect backyard addition. But if you have close neighbors or live in an area with restrictions on wood burning, you’re not out of luck. Just make yours a gas or propane model instead of wood-burning. Pros: Wood-burning fire pits are straightforward to build, with many options available at all price points. If you’re DIY-savvy, you can even build your own. Cons: Wood fires contribute to air pollution, and their use is banned or restricted in some areas. Sparks flying out of the pit can also increase fire dangers; using a protective screen can help minimize this risk. Pros: Lighting the fire in a gas fire pit is as easy as flipping a switch, which may mean you use it more often. Gas fire pits can often be installed where wood fire pits cannot, such as on decks. Cons: Installation is more expensive and is dependent on being able to connect to an underground natural gas line. Once installed, you cannot move the fire pit. Pros: Like natural gas, a propane-burning fire pit is quick and easy to light. 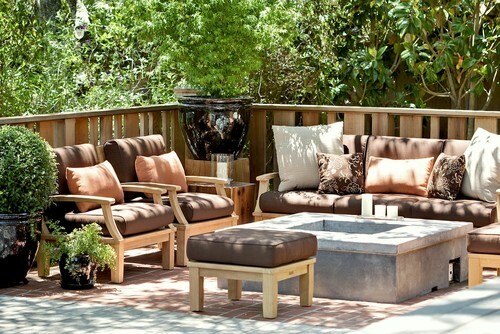 Some propane fire pits are free-standing and can be moved easily. Cons: You will need to monitor propane levels and haul the (heavy) canister back and forth to the store regularly for refills. Some (but certainly not all) propane fire pits look a bit clunky. It’s not easy to hide a bulky propane tank, and some pits do this better than others. 3. A fire pit lights up the night. All the fancy landscape lighting in the world can’t compete with the flickering blaze of a real fire. Use the warm light emanating from your fire pit to light up a far corner of your yard without having to fuss with electricity. 4. 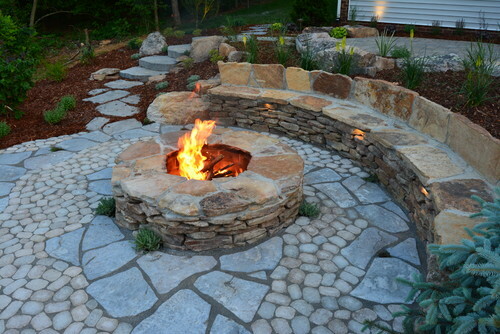 A fire pit can work in spaces both large and small. 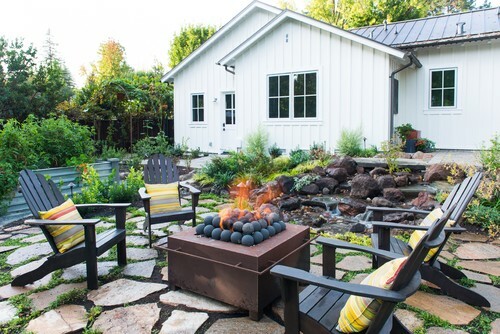 Even a compact urban yard or patio can handle a fire pit. In fact, it’s sure to become the centerpiece of a small yard. 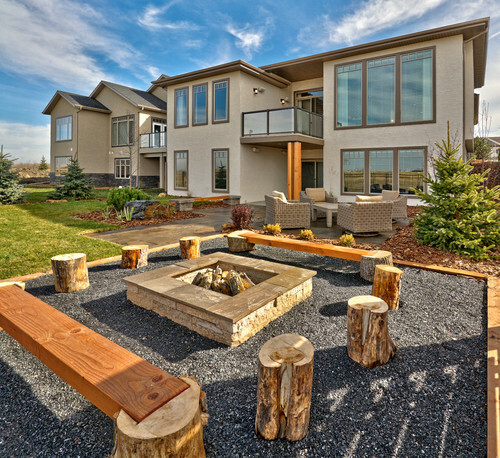 In a large yard, sprawl out with a big fire pit surrounded by bench seating for a crowd. 5. A fire pit is an outdoor feature you can use year-round. 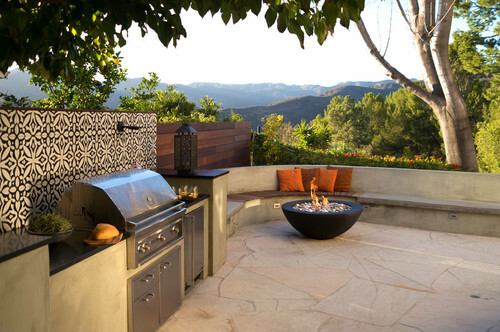 You would be hard pressed to find a backyard feature as versatile as the fire pit. In the summer, roast s’mores by starlight. In fall and winter, wrap yourself in a thick blanket and sip hot cider or cocoa while gathered with friends and family around the cozy blaze. 6. 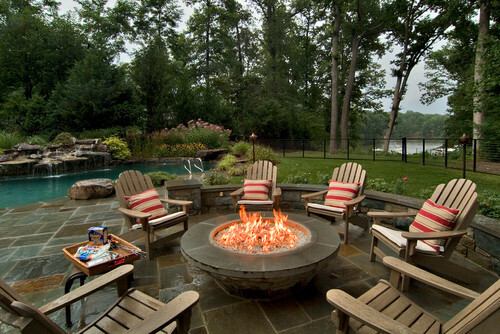 A fire pit creates a cozy atmosphere for two. Fire pits aren’t just good for parties, they are equally suited to romantic nights for two. You may be tempted to skip the wine bar when you can sip vino beside the fire in your own backyard as stars twinkle overhead. 7. Fire pits are available at all price points. From simple fire bowls and DIY projects to elaborate custom designs with built-in bench seating, there is sure to be a fire pit that fits your budget. Whichever style you choose, don’t skimp on safety, and be sure to place the fire pit on a nonflammable surface. Fire pits should be at least 10 feet from your home or other structures. Some city and county codes may require an even greater distance, so be sure to check before you build. Don’t place a fire pit beneath a tree or overhang. Don’t burn on “spare the air” days if these are used in your area. Don’t put a wood-burning fire pit on a deck. A gas fire pit won’t send out dangerous sparks, making it the safer choice. Educate your kids about fire safety, and always supervise children around an open flame, even when you’re sure they know the rules. Keep a container of water, a hose, a fire extinguisher or all three on hand whenever you light up the fire pit. 8. You can even use a fire pit to make dinner. Make a backyard campout feel even more authentic by cooking dinner over the open flames. Cooking over a gas fire pit is not advised, but if you have a wood fire pit, you’ve got options: Place a grill rack over the fire to cook above the flames, or wrap up foil packets and tuck them among the coals. Then pull up a seat and dig in. Food always tastes better outside! 9. And, of course, a fire pit is perfect for s’mores. Kids (and kids-at-heart) know that making s’mores is one of life’s great pleasures. 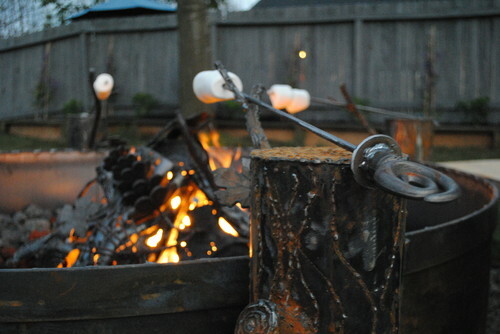 With a fire pit in your own backyard, why not make every Friday night s’mores night? 10. 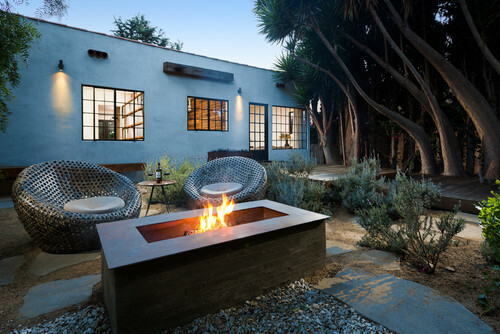 A fire pit may help you sell your home. 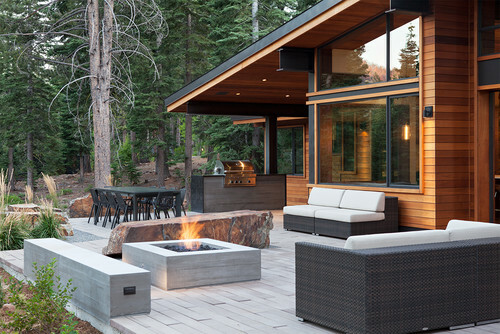 According to a recent Houzz survey, fire pits are among the three most popular backyard additions by renovating homeowners. In other words, fire pits are hot. Having an attractive and well-maintained fire pit in your yard could give your home an edge if you decide to sell. But once you have that cool new fire pit, you probably won’t ever want to leave. 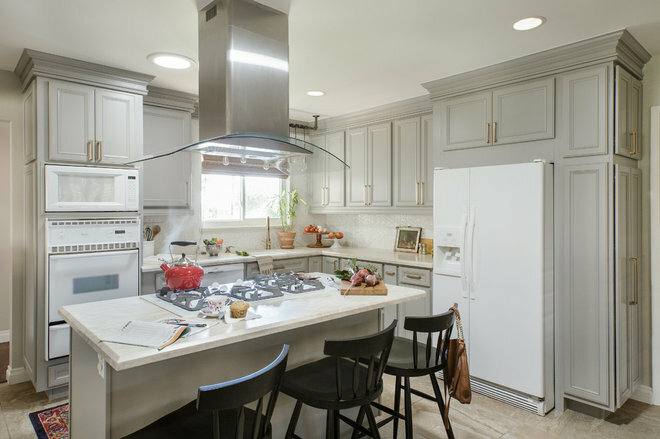 Many people want to change their kitchen, whether it’s because it functions poorly, their taste has evolved or they purchased a home marked by someone else’s style. 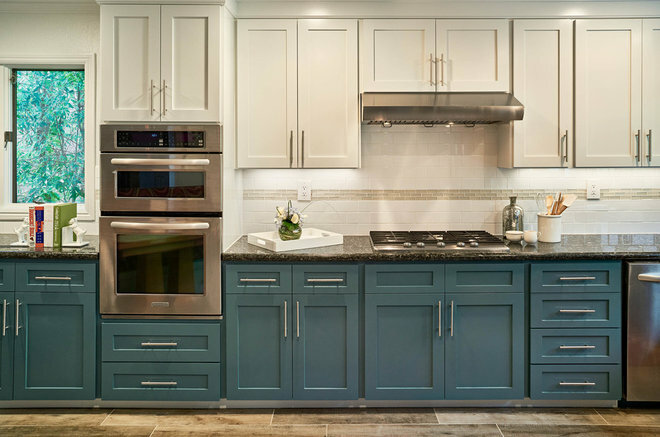 In fact, “can no longer stand the old kitchen” is the top reason homeowners choose to remodel kitchens, according to Houzz research. 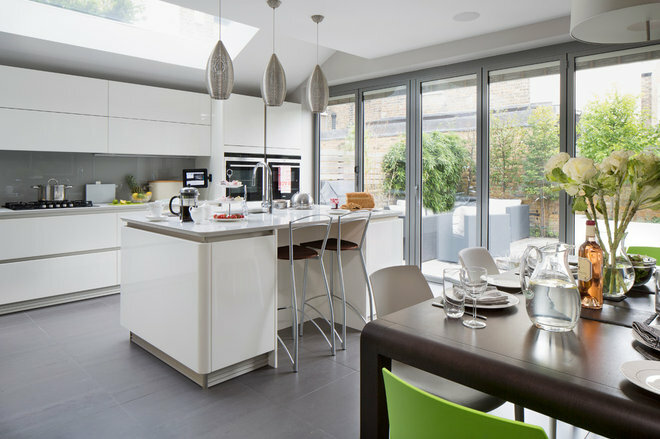 If you’re experiencing kitchen fatigue and are looking for inspiration, take a look at these 13 kitchen transformations. Perhaps you’ll find your kitchen soul mate here. 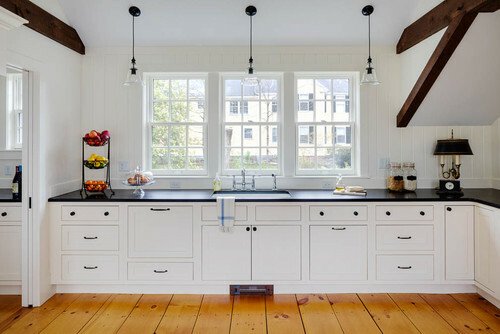 Designers: Halsey Platt and Diana MacLeod of Platt BuildersBEFORE: The kitchen in this Massachusetts home occupies what used to be a barn, and the low roof meant windows that were just 12 inches tall. AFTER: The homeowners raised the roof 18 inches, allowing for bigger windows and a proper view. The remodel also exposed some of the original beams, and added new ones to highlight the space’s historical character. 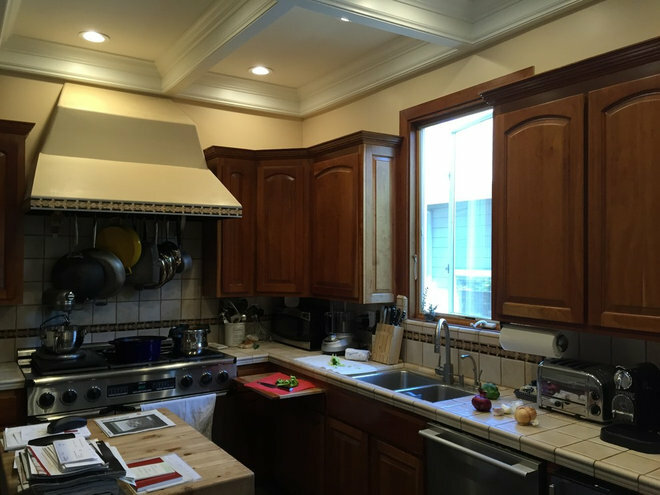 BEFORE: Though this kitchen was in good condition, the Bhargavas had lived in Switzerland and wanted to change this space to incorporate features they’d enjoyed in their European kitchen. 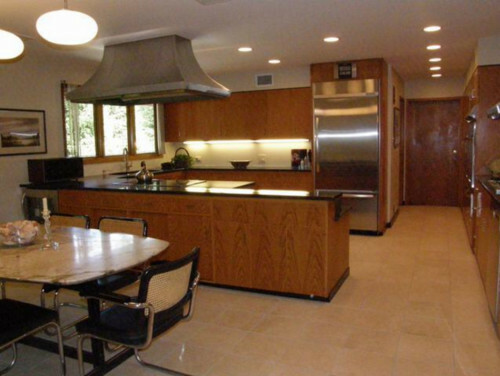 AFTER: The renovation was pretty complete: cabinetry, counters, appliances, windows. The result is a streamlined look, as well as a space that the owners find easy to clean. Year built: 1972BEFORE: When the Smiths purchased this home from the original owner, it had hardly been changed since it was built in the early 1970s. The new owners found the kitchen cramped, and disliked the wall separating it from the dining room. AFTER: The Smiths took out the wall separating the dining room from the kitchen, creating a much larger kitchen. They swapped the old dark wood cabinetry for bright new white cabinets, wooden shelves and a tile backsplash. Veddinge cabinets, Luftig range hood and Ringskär faucet: Ikea; undermount deep single-bowl sink: Zuhne; dinnerware: Coupe line in opaque white, Heath Ceramics; pendant lights: Luna, Schoolhouse Electric & Supply Co.
Year built: Late 1800sBEFORE: The homeowners decided that the kitchen needed to be fully renovated, and did most of the work themselves. 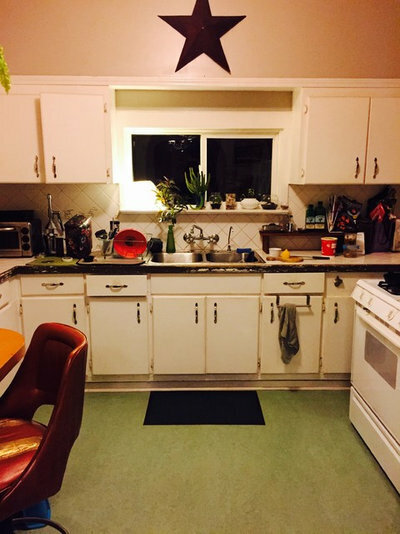 AFTER: The couple installed white cabinets and a farmhouse sink, both from Ikea. Not installing upper cabinets helps keep the space feeling more open. Though it isn’t visible, the biggest cost during the renovation was plumbing; the owners installed new water and sewer lines, a new water heater and new drain valves. The next three kitchen makeovers share the approach of painting the upper cabinets one color, the lower another. Each took on two-tone in their own unique way. BEFORE: A big concern before the renovation was that the kitchen looked small and cramped because it was dark. 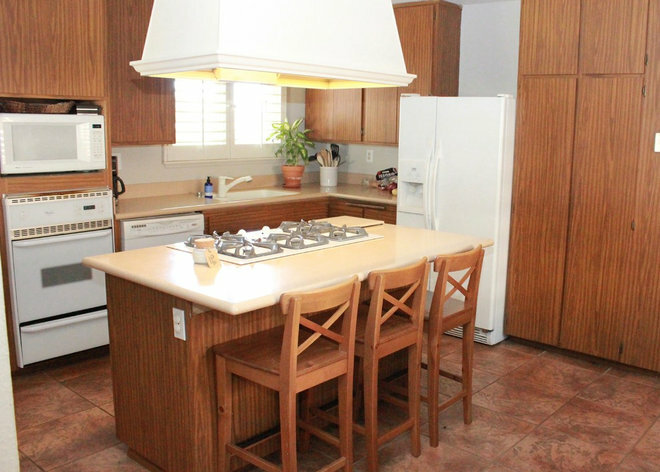 But the cabinet bases, appliances and countertops were in excellent shape. Their designer nudged the couple toward a two-tone cabinet scheme. 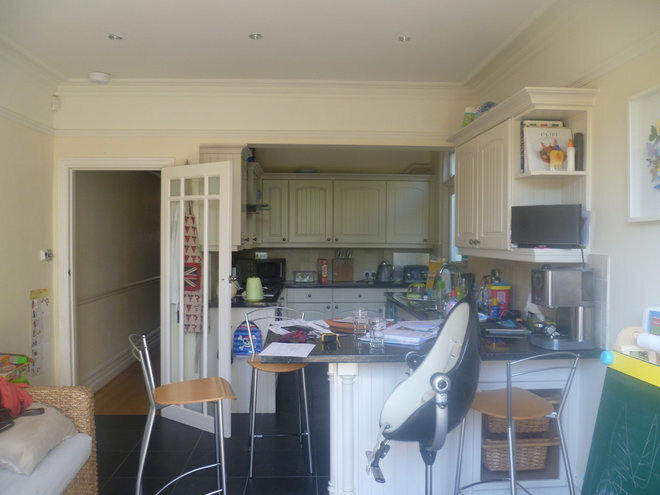 BEFORE: A wall separated the kitchen from the front part of the house, making it an impractical space for entertaining. The family decided on a full remodel for the kitchen. AFTER: The new kitchen is open to the rest of the home, creating a much easier flow for entertaining. The coffered ceiling had to go, because the coffers stopped where the wall separating the kitchen from the rest of the space had been. The couple chose a high-shine gray for the ceiling. The accent wall is composed of three Eastern Promise cement tile designs by Martyn Lawrence Bullard for Ann Sacks: Fez, Marrakesh and Tangier. 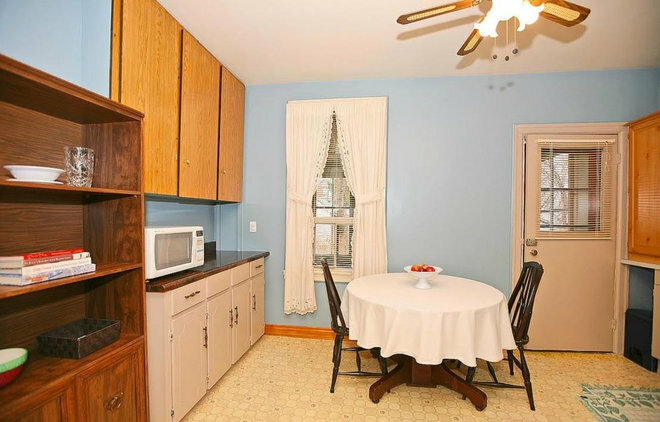 Note also the blue-gray cabinets on the lower half, and white uppers. 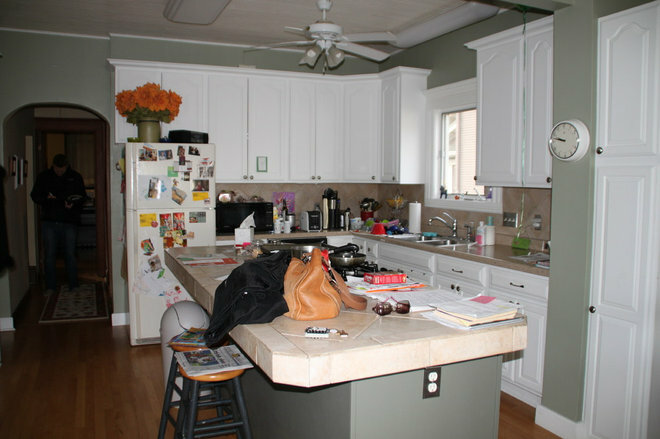 BEFORE: This kitchen lacked sufficient counter space and cabinet storage, and was dark. AFTER: The designer came up with a U-shaped layout to maximize space and storage, and the clients settled on a two-tone scheme for their cabinets. 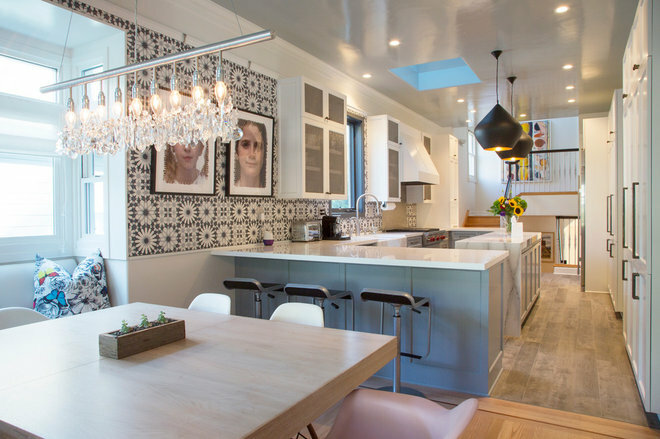 A shimmery backsplash tile elevates the design. The open shelves were made by a local woodworker; the brackets are simple silver ones from Ikea that the homeowners spray-painted a satin brass to match the faucet and other hardware. 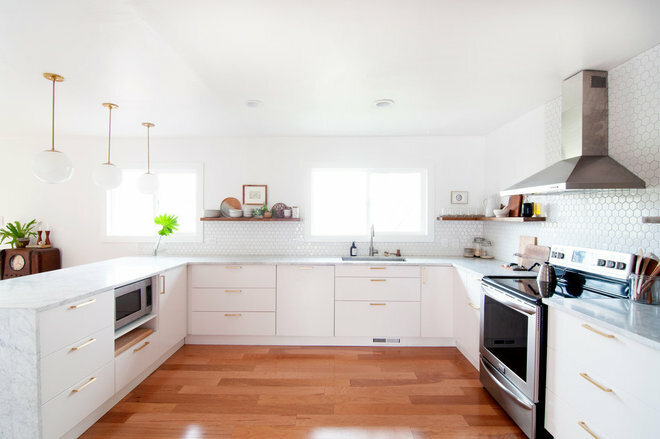 Choosing WoodThough white cabinets still reign supreme, with 42 percent of renovators choosing them, wood is second in terms of popularity, accounting for 29 percent of cabinets among renovators. 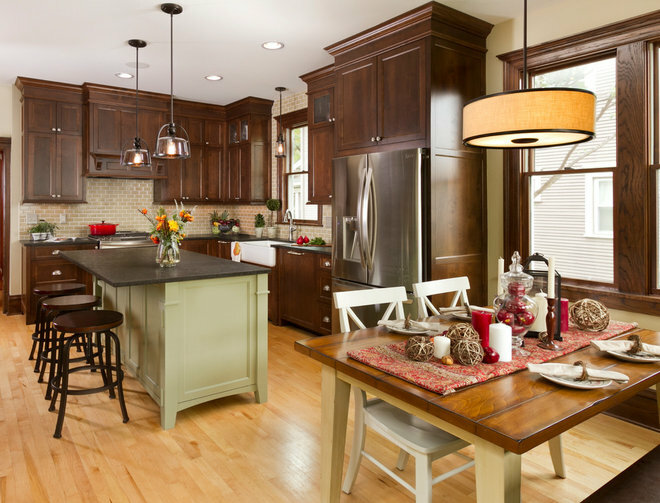 The following three kitchens show examples of updates using wood cabinetry. 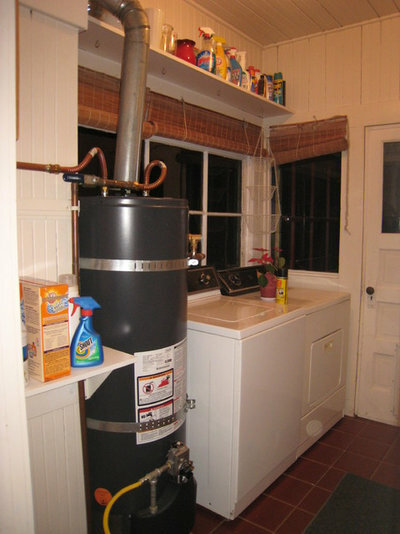 BEFORE: The oddest thing about the old kitchen was that it was made up of several separated, dark rooms, including this back entry and its unsightly water heater. 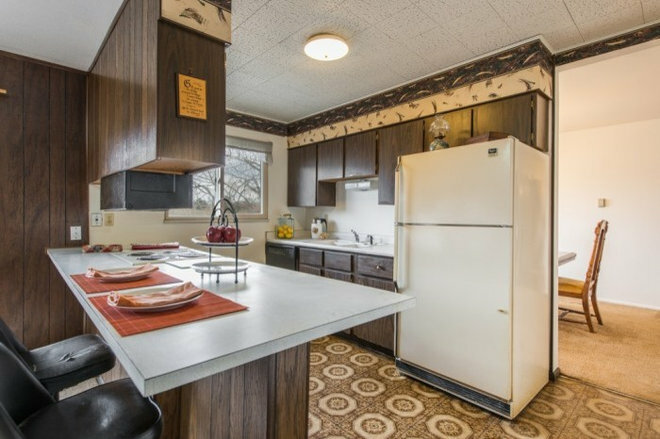 The laundry room was connected to a dining area that included a range and the refrigerator. The kitchen sink was in its own separate room. AFTER: The designer took down walls to open the laundry space to the kitchen. She hid the water heater inside custom Shaker-style cabinetry. Warm cherrywood cabinets, a creamy subway tile backsplash and beautiful wood floors make the kitchen feel fresh and new. The refrigerator preserves a retro note. 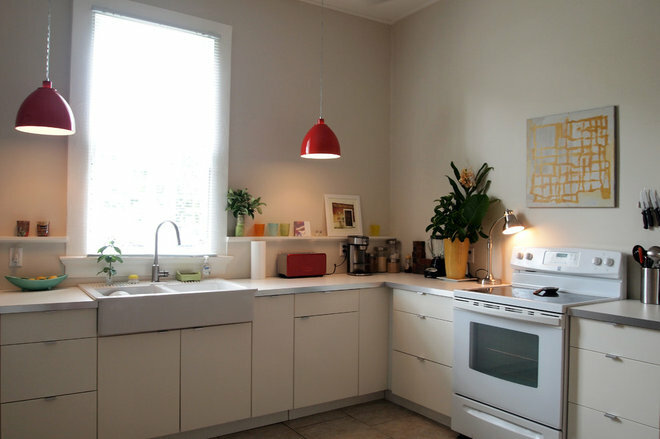 Designer: Encircle Design and BuildBEFORE: The kitchen was dark, and dirt and scuffs showed on the white cabinets. The family wanted more workspace and storage. 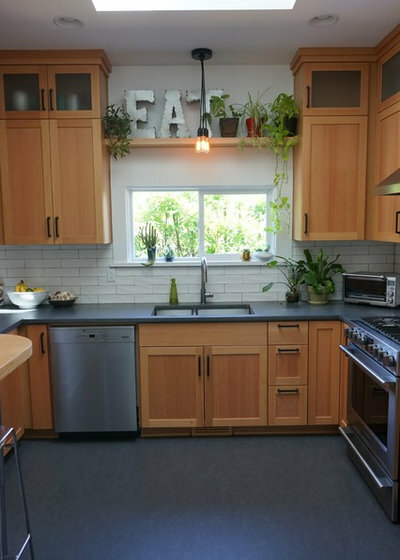 AFTER: Designer Michelle Ruber and writer Becky Harris decided to call the style of this kitchen “eco-modern farmhouse,” thanks to its mashup of elements. 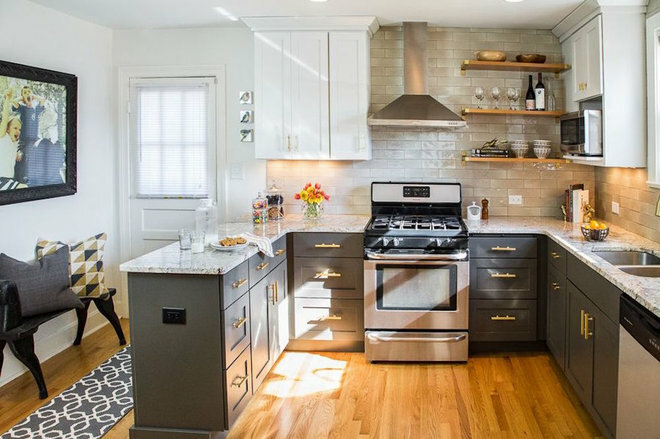 The Shaker-style cabinets, steel drawer pulls and subway-like tiles recall farmhouse style, while the stainless steel appliances, color palette and clean lines look more modern. The homeowners used local vendors and materials for an environmentally friendly design. A skylight brings in extra light, while taller cabinets enhance the storage space. 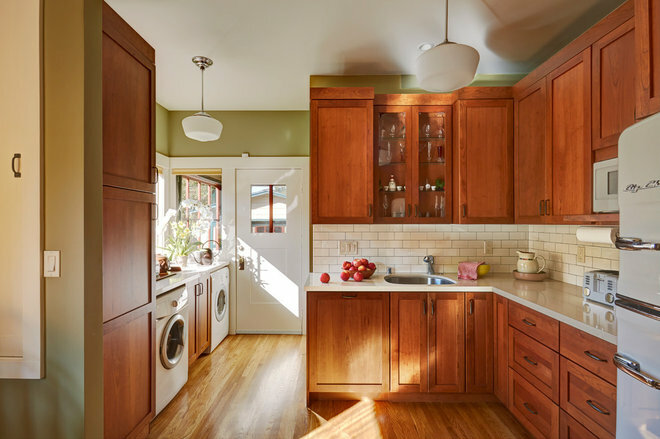 Designer: Shelly Lindstrom of Fluidesign StudioBEFORE: The kitchen was stuck in the 1980s, in an 1894 home. The family and designer wanted to make it fit the period when it was built. 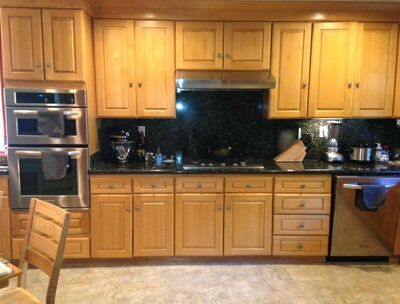 AFTER: The designer chose alder cabinetry in a dark stain to match the millwork in other rooms. 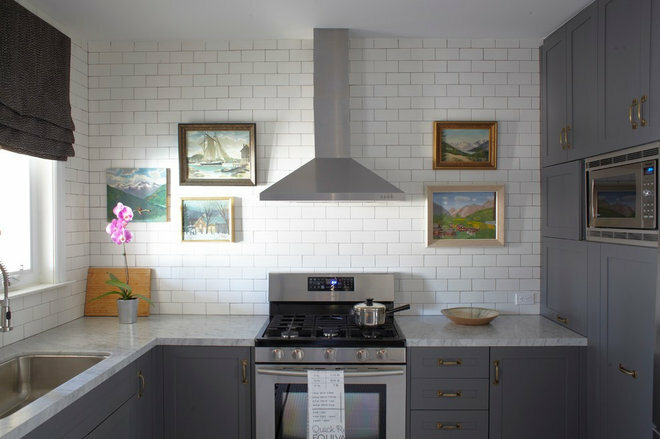 The backsplash is composed of handmade, custom-glazed tile of the sort one would have seen in a Craftsman bungalow during the late 1800s. Since the home straddles Victorian and Craftsman style, it works. Our final three kitchens avoided the wood-to-white versus white-to-wood quandary — their styles were changed completely. Read on for three unique renovations. 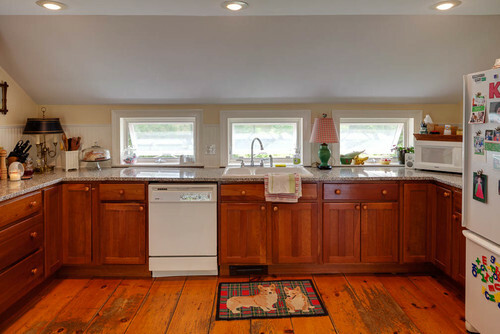 BEFORE: Beadboard did not fit the taste of the homeowners, who were expecting their second child as the renovation took place. AFTER: The couple extended their ground-floor kitchen into the adjacent side yard, adding 5 feet of space. Large skylights and glass doors bring in the light. 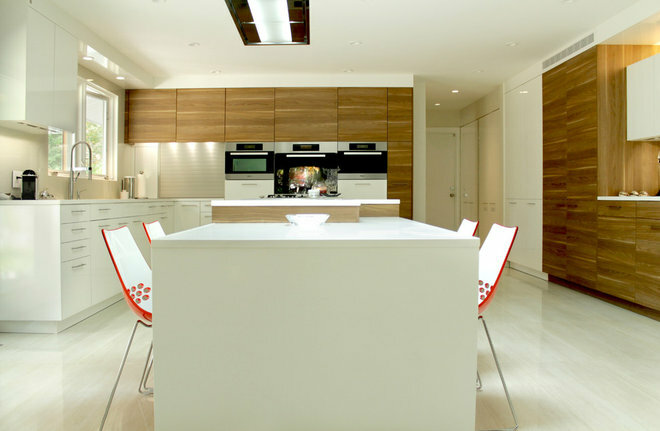 Glossy white cabinets offer a sleek look. BEFORE: This kitchen came with a problem that doesn’t seem, at face value, like it would actually be a problem: The pantry was just too deep. But the pantry, to the right of the refrigerator, took up too much of the area that could be more counter space — and it was so deep that the family would often lose things in it. 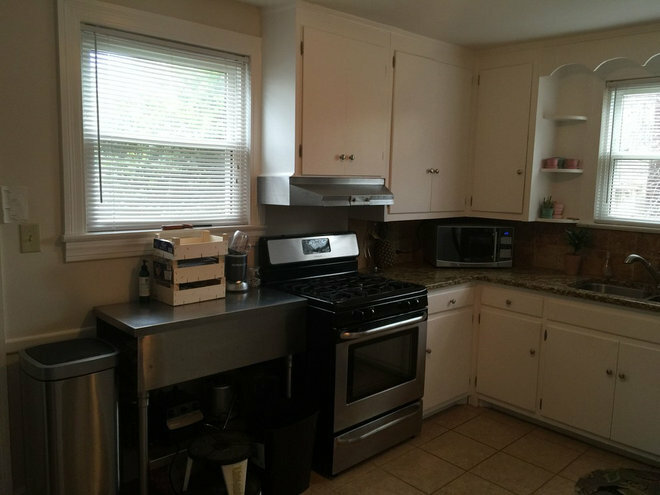 BEFORE: The kitchen had insufficient storage and countertop space, and a not-very-functional workflow. AFTER: Talk about a dramatic change. 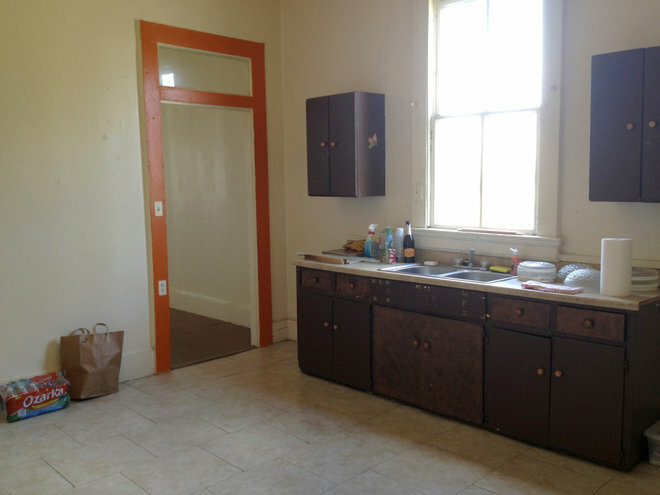 The window over the sink at left is where the door used to be. Botrie likes spaces that contrast dark and light, as the color scheme for this room shows. She also prefers a traditional vibe overall, with modern touches. Dark grout makes it easier to keep the tilework looking clean. Remodeling’s report also points to broader renovation trends that seem to be catching on nationwide. One definitely worth watching is energy efficiency—including simple jobs like adding insulation. All summer I have been looking at my deck, knowing that a change was needed. I’ve been planning a deck refresh for months and after a very rainy July I’ve finally completed my project. Here’s how to stain a deck (and the lazy but effective way to strip and prep it too). Before we bought our home, it was used as a rental property. It’s safe to say that nothing was maintained before we moved in and the deck was no different. The deck needed a good cleaning before we did anything, so we decided to use our pressure washer to get rid of years of grime (we have this Ryobi 2700 psi Pressure Washer). Why yes, that’s me – unbrushed hair, in PJs and running a pressure washing. Isn’t that how people do DIYs? A note about pressure washing: be careful. You need to get pretty close to make a difference in the wood, but don’t get too close or your will take some of the wood clean off. I did that in a few spots, so start far and move to where you’re at a safe distance. Our deck was chipped and a lot of the wood was showing already, so I knew I was at a good distance when I saw the wood changing color. This step also helped with stripped as a lot of the loose paint came clean off. HOW TO STAIN A DECK STEP 2: STRIP IT. I really didn’t want to sand the deck. I knew it was going to be a lot of work, and time was of the essence. I was reading a lot of reviews online about the Behr Premium Wood Stain & Finish Stripperand they were mixed. I decided to go to the Home Depot and speak to someone myself about it. The lady I spoke with, used the product herself and said it worked great. She said to follow the instructions exclusively as the complaints she has had came from people who didn’t read the bottle and did their own thing. I used a foam paint roller to spread the Behr Premium Wood Stain & Finish Stripper on, the process was pretty quick. There is no diluting the product and make sure to shake the container. We didn’t at first and it came out in a thin liquid, when it should be a thick and goopy consistency. It’s important to follow the instructions for application, it tells you the optimal time for application. We did ours in the morning when the heat was low and there was less direct sunlight. We let the wood stripper sit for 45 minutes on the bottom deck and about 30 minutes on the top deck, any area that started to dry (due to direct sunlight) we used the garden hose on the mist setting. When it was ready, we took a deck brush and scrubbed hard. Who am I kidding with “we”, my husband did that part. Remember this is basically an acid so don’t use your brand new running shoes, my husband wore rubber boots and clothes he didn’t care about. If you’re wearing rubber boots – the deck is slippery, so watch your footing. Spray off the stripper and you’ll see the paint start to come off! We first did it with a garden hose but switched over to the pressure washer after. It made it so much easier. The wood stripper got almost all of the previous paint off. There were a few spots where I still had some paint left over, and I should have sanded it off but I didn’t. I don’t recommend doing that as if you’re staining – this will not cover it up. I would say I got 95% of all the previous red paint off the deck. Keep that in mind. The lady at Home Depot couldn’t stress this step enough. You need to use the Behr Premium All In One Wood Cleaner after the deck stripper. It takes all the remaining stripper off the deck, so the stain or paint will adhere better. I’m the kind of person who starts a project and just wants it done. I hate it when it takes multiple days, but I also knew that I would be choked if the stain didn’t work due to me rushing and skipping steps. I used the wood cleaner a few hours after the stripper was used. I diluted the wood cleaner in a 1:1 ratio of water and went to work. I used the pressure washer to rinse it off, then let it dry and rinsed it off again. Rinse it until all the foam is gone. Let the wood dry for 24 hours. FINALLY! We’re at the step where your hard work shows. This step went surprisingly fast and the immediate results made my Millennial brain happy. I decided on the BEHR PREMIUM® Semi-Transparent Weatherproofing All-In-One Wood Stain & Sealer, tinted in Redwood Naturaltone ST-122. I chose semi-transparent because I wanted to show the natural grain of the wood but still give it a nice color. It’s made out of a 100% acrylic formula, which seals out the elements and sun’s harmful UV rays for up to 6 years on high traffic areas like decks, and up to 8 yrs. on fences & siding. I like how it saves me a step on sealing, it has a sealer built in. The application was really easy. I used a deck pad and brushed it on, it took me 20 minutes to do my whole deck and 10-15 minutes for the trickier areas like the seating bench and stairs. For those trickier areas, I used this deck staining detail kit. It says to use two thin coats, but in some areas, I used a thicker application by accident. You can’t tell I did that, it evened out nicely. I used a whole can on my first application. I was planning on putting on my second coat the next day but noticed the deck still felt a little tack so I waited. Then it rained a few days later. So I had to put off the second coat for a few weeks. The second coat was easy and brought a beautiful finish to the deck. It looks so much better now and I love the results. DECK STAIN BEFORE AND AFTER. What a difference it made! The wood is old, but the Behr Premium® products brought the life back to it. I love the way it looks. I was intimated with this project at first, but my best advice is to dive in and just do it.